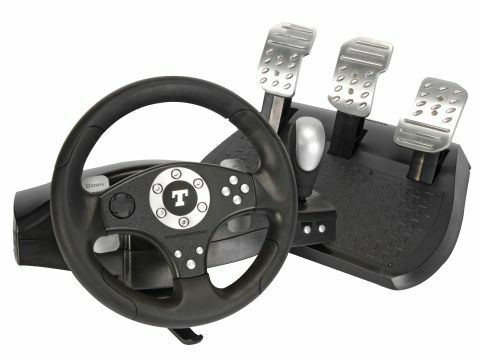 Thrustmaster's previous RGT model was met with a reasonably warm reception, but we had a couple of criticisms. For one, the gear changes were a bit hit and miss, thanks to the slightly limp shifter mechanism, and if you wanted to use a clutch pedal, you had to buy another two pedal set and have both under your desk - not hugely practical. The RGT Clutch Edition puts paid to both these irritating problems, with a sturdier sequential stick and a three-pedal set included as standard. Unfortunately, the satisfying click on both the gear and paddle shifters has gone, apparently in favour of increased durability. Also, the detail in the force feedback isn't quite on a par with Logitech's recent efforts, giving the wheel a slightly deadened feel even over tooth-rattling rumble strips. Of course, it was never likely to dislodge the Logitech G25 from the top spot, but the RGT is almost half the price, so it makes a lot more sense to us in financial terms at least. If you're one of those kerazy people who won't drop £150 on a game controller, bear this in mind.